(Newser) – Fred Rivera believed his best friend, Herman Johnson, died in his arms after a rocket hit them during a Vietnam War firefight in 1969. "Surviving comrades of that horrid day presented me a bracelet fashioned from the leather laces of Herman’s boots," Rivera writes of what followed. "I have worn it every day since, without fail." But in reality, Johnson was airlifted out in a body bag, woke up in a "make-shift morgue" with a toe tag, recovered, and never saw Rivera again, believing him to also be dead. 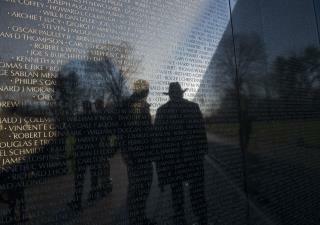 Nearly five decades later, an Iraq veteran went to the Vietnam Veterans Memorial Wall to take a rubbing of Johnson's name so Rivera could hang it on his wall, next to Johnson's picture—only to discover Johnson's name wasn't there. With the help of other veterans, Johnson was found, alive and living in Michigan, Courthouse News Service reports. Get the he11 shot out of you in some foreign country by people you've never met before and probably have nothing against, wake up in a cold dark morgue screaming for help and wind up with a $1 trinket stuck on your chest 47 years later to show what a sucker you were for going over there and getting shot in the first place.